October 11, 2013: Immigration Reform: What's Next? The Immigration Law Association, with the support of the Giannini Foundation and the Gifford and IFHA Centers, held a conference October 11, 2013 on What's Next for Immigration Reform. Over 100 participants heard 15 speakers discuss the immigration enforcement juggernaut that is deporting over 1,000 foreigners a day, guest worker issues, and the dim prospects for comprehensive immigration reform. The prospects for comprehensive immigration reform seemed bright after the 2012 elections and the Democrat-controlled Senate's approval of the Border Security, Economic Opportunity, and Immigration Modernization Act of 2013 (S 744) on a 68-32 vote in June 2013. Migrant advocates are uncomfortable with S 744's long 13-year path to US citizenship and its $46 billion "border surge," but most believe that S 744 is the best way to regularize the status of most of the estimated 11-12 million unauthorized foreigners. The Republican-controlled House has so far refused to consider S744, opting instead for a piece-meal approach to immigration reform that includes committee-passed bills that would increase enforcement of immigration laws and create new guest worker programs for highly skilled and agricultural workers. Advocates of the Senate's S 744 comprehensive immigration reform bill would like the full House to enact at least one bill so that there can be a House-Senate conference committee to iron out a compromise bill. They hope that House Republicans who are opposed to "amnesty" would accept a conference-approved bill includes the increased enforcement that restrictionists want and the legalization admissionists want. The US has about 20 percent of the world's 230 million international migrants, and accepts 1.1 million immigrants and almost 500,000 nonimmigrant or temporary foreign workers each year. The H-1B program admits foreigners requested by US employers who have a Bachelor's degree and are coming to the US to fill jobs that require Bachelor's degrees. The H-1B program is controversial, with some asserting that US employers need easy access to the world's "best and brightest" to remain competitive in a globalizing world while others counter that the H-1B program allows US employers to select young foreigners who are "indentured" or tied to them and hope to be sponsored for a US immigrant visa. The data to definitively answer the question of whether H-1B foreigners are a selective labor subsidy or a boost to US innovation are not available. Models that use available data generally find that H-1B foreigners have more education than similar US workers in the same occupation and higher wages in computer-related jobs, and some evidence suggests that more H-1B workers are associated with more innovation. However, analysis of data on jobs and workers conducted by Bright, a firm that helps employers sift through the thousands of resumes they receive, suggests that there are generally plenty of US workers to fill IT-related jobs, with the exception of relatively low-skill and low-paid jobs such as computer systems analyst that are often filled by H-1B workers employed by outsourcers that have workers in both the US and India to handle a firm's computer needs. Agriculture employs less than two percent of US workers, but over 40 percent of the 2.7 million unauthorized foreigners legalized under the Immigration Reform and Control Act of 1986 received an immigrant status under the Special Agricultural Worker legalization program. Today, over half of the two to 2.5 million hired farm workers are believed to be unauthorized, and the immigration status quo creates uncertainty for farm employers, farm workers and their families, and rural and agricultural communities. The worker advocate-farm employer compromise to legalize the farm workforce, known as AgJOBS, was first negotiated in summer 2000 after the election of new presidents in Mexico and the US that prompted fears of a new guest worker program among worker advocates. AgJOBS would allow currently unauthorized workers to legalize their status and make it easier for farm employers to obtain legal guest workers. Under AgJOBS or a similar House bill that makes it easier to obtain guest workers but does not legalize currently unauthorized farm workers, future farm guest workers may come from countries other than Mexico, since they could stay in the US several years and work in year-round jobs, justifying the cost of bringing farm workers from Asia and elsewhere. Mexican economic growth means there are fewer rural Mexicans willing to migrate to the US to fill farm jobs. The number of Mexicans employed in agriculture has been reduced by over half since the early 1990s, and education levels have risen so that the average 30 year-old Mexican-born farm worker in the US has seven years of schooling, while the 30 year-old Mexican has nine years of schooling. Once workers leave agriculture, few return, and the children of farm workers in fast-growing countries shun farm work. Many speakers reminded participants that over a million foreigners have been deported since President Obama was elected in 2008, and deportations continue at over 1,100 a day or 400,000 a year. They noted that some restrictionists want the status quo to continue, believing that a combination of US government deportations and "self-deportations" can significantly reduce the stock of unauthorized foreigners in the US. Restrictionists see time as on their side, as the number of unauthorized foreigners in the US shrinks. Most admissionists believe that comprehensive immigration reform that includes legalization is inevitable because of changing demographics and the increased number of families whose members have various legal statuses. However, it is hard to predict exactly when Congress will approve an immigration reform that includes the three components of more enforcement, a path to legal status for most of the unauthorized, and new temporary worker programs. 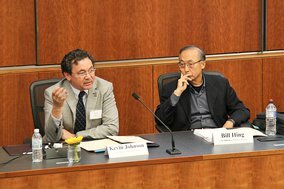 Some worry that the difficult path to comprehensive immigration reform will encourage advocates who have been pushing for legalization for over a decade to concede too much, thereby allowing US law to criminalize more immigrant behavior, expanding the one-strike-and-you-are-out approach to immigrant behavior. 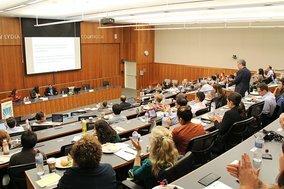 In this sense, advocates worry that while deportations continue, state and local governments will continue to enact laws criminalizing the actions of unauthorized foreigners, and that the US Supreme Court will eventually uphold some state and local government immigration-enforcement laws in ways that could further increase deportations. 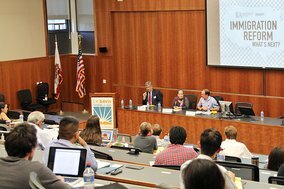 Most speakers and participants emphasized the urgency of comprehensive immigration reform on legal, economic, and moral grounds. However, instead of a celebration that such a reform would be enacted soon, there was a sense that the road to comprehensive immigration reform will be narrow and rocky rather than wide and smooth. This page was last updated on January 18, 2018.